WANT TO WIN SOME CASH FOR SHOWING YOUR MOVES LINE DANCING TO COUNTRY WESTERN SONGS? 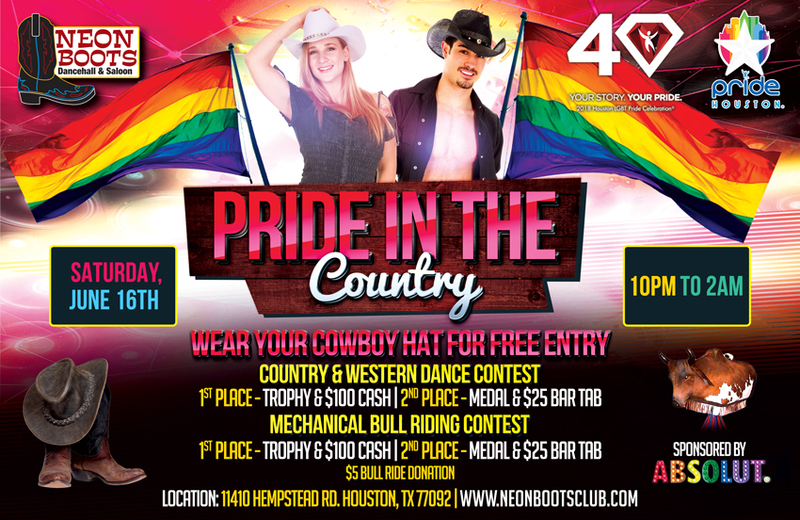 The Official Pride Houston “PRIDE IN THE COUNTRY LINE DANCE CONTEST” is Saturday, June 16th. Contest starts at 11:00pm on the Dance floor at Neon Boots Dancehall & Saloon. The entry is also Free. Be ready to show your moves dancing to the following songs. This will be a FUN event and open to anyone whether you have line dance experience or not. All Dancers entering the contest must Register online or on the day of the Contest BEFORE it starts at 11pm. Each Dancer will be assigned a random number that will be used to announce who moves on to the next round. All Dancers participating in the contest must dance to the 1st initial song to be qualified to move on to each round in the contest. There will be 3 rounds total. Each Dancer will be Judged based on dancing the correct moves of each Line Dance song played and looking like you’re having Fun. At the end of each round, your assigned random number will be announced stating you will move to the next round of the Contest. If your number is not announced you will be asked to exit the dance floor. A total of four (3) Line Dance songs will be played and during each round the contestants will be narrowed down to to a final group to be judged. Just have FUN Dancing and bring your friends to have a Great time! Please enter the following information below completely to enter the LINE DANCE CONTEST.